Available from Amazon.com , from Amazon.co.uk , from all good bookstores, and directly from the publisher, Coachwhip Publications, in quantities at: www.coachwhipbooks.com. The Encyclopaedia of New and Rediscovered Animals is the third, wholly-updated edition of the very first - and still the definitive - book to be devoted to the spectacular zoological discoveries and equally amazing rediscoveries of the 20th century, which attracted international acclaim and exemplary reviews following its original publication in 1993 (when it was entitled The Lost Ark), and its subsequent republication in 2002 as an updated, greatly-expanded second edition (entitled The New Zoo). This latest edition also contains an in-depth survey of the 21st century抯 most celebrated discoveries and rediscoveries made during its first decade, plus an exhaustive, significantly-increased bibliography, plus an extensive foreword by pre-eminent American cryptozoologist Loren Coleman, as well as the only comprehensive collection of colour and b/w illustrations of these spectacular animal species ever published (including new, previously-unpublished photographs, and several exclusive, specially-commissioned full-colour paintings). "Karl Shuker decided to turn his entire life-long interest in cryptozoology into a writing career. Soon Karl found himself writing articles for popular magazines and thoroughly researching several more scholarly book ideas. Down through the years, Shuker has written regular cryptozoological columns for various English-language magazines, and became a contributing editor and cryptozoological columnist for other publications. Karl Shuker continues to appear regularly on television and radio programs, and is today widely recognized as one of the leading experts in cryptozoology because of his attention to scientific detail. Through many years of hard work, Shuker was able to see many of his projects come to print, including the early versions of the book you are reading today. Further labor and updating of his studies would follow, and Shuker has toiled to revise his research continuously with the latest new data, discoveries, and discussions. His volumes have become some of the most important cornerstone works for the new generation of cryptozoologists in the 21st century. You will not be disappointed by the near decade of fine-tuning and massive revisions that Shuker has put into this book. After decades of intensive research and revisions, I am happy to see so many of Karl Shuker抯 books remain in print, and especially this one. This book's impact has been enormous. Because Karl Shuker抯 research is based on rigorous dedication to scientific method and scholarship and due to his solid background in zoology, Shuker抯 works are respected throughout the scientific community and the popular cryptozoology fraternity, as they should be. This volume will not disappoint you, and, mark my word, it will influence the field of cryptozoology for decades to come." Loren Coleman, quoted from his foreword to this book. "Karl抯 new book, The Encyclopaedia of New and Rediscovered Animals includes an entire section devoted to reptiles and amphibians, and makes fascinating reading. He writes about newly-discovered monitor lizards, the world抯 first-known lungless caecilian, the hairy frog, Blomberg抯 giant toad, the goliath frog, dwarf amphiuma, the chameleon snake, Venezuelan skunk frog, new anaconda species, the world抯 largest species of spitting cobra, taipans, plus the rediscoveries of giant Canary Island lizards and the painted frog of Palestine. Karl also covers the fascinating history of Delcourt抯 giant gecko, new crocodilians and chelonians, India抯 purple frog and the Galapagos pink iguana, plus the vampire tadpoles of Vietnam!...If this year is exciting as last, who can predict what will be discovered?" David Alderton, Practical Reptile Keeping , January 2012. "IAN'S RECOMMENDATION: For those with an interest in cryptozoology." Ian Poulsen, Birdbooker Report #209, The Guardian , 12 February 2012. 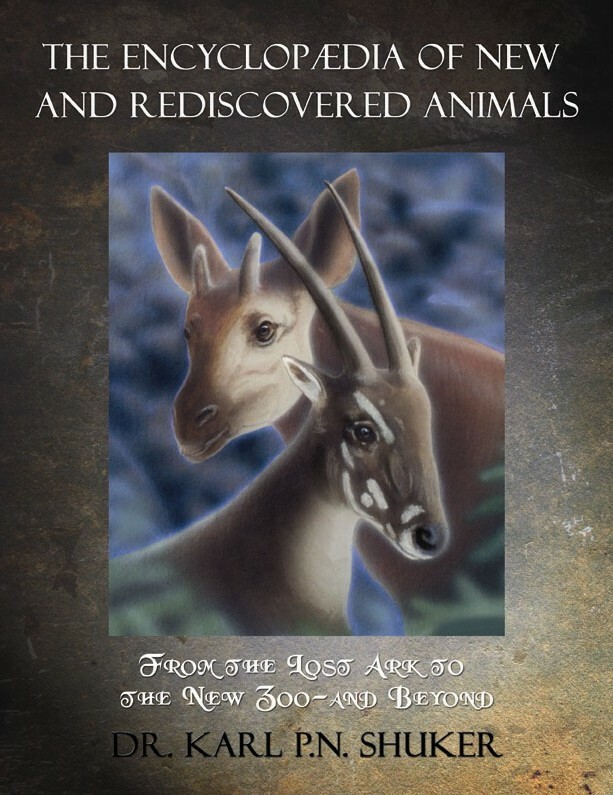 "First, back in 1992, there was The Lost Ark ; then, in 2001, Karl Shuker's ground-breaking survey of new and rediscovered animals was republished as The New Zoo . Now, in what seems to be establishing itself as a once-a-decade overhaul, a third edition has appeared, bringing the story as nearly up to date as possible..."A wise scientist does not take pride in how much he knows," writes Shuker, "but rather takes heed of how little he knows". This book is a good reminder of the truth of that dictum, and it's nice to see it back in print and bigger than ever." Fortean Times , May 2012. "This is a mammoth collection of scientific achievements from 1900 to the present. It抯 information-packed, sumptuously illustrated, and just plain fun. Shuker does not, of course, try to include all discoveries, since the beetles alone would merit a library. He goes for creatures which are relatively large or scientifically important, and those are more than sufficient to fill this large-format 368-page book. Shuker is a highly knowledgeable writer (as you抎 expect from a Ph.D. who抯 been poking into the odd corners of zoology for four decades). He discusses both species and important subspecies (including those where there is some dispute about taxonomy: it抯 not clear whether Rothschild抯 giraffe is a subspecies, species, or just a local variation.) The zoologically inclined reader will enjoy every page of this romp through monk seals, giant stick insects, megamouth sharks, monitor lizards, and other discoveries simply too numerous to mention...Being a Shuker work, this book has plenty of mysteries along with the definite discoveries. Some are well-known: some, like a slow loris with a thick bushy tail, not yet recognized although it抯 been held in captivity and photographed, surprised even a well-read aficionado like myself...He closes with a few words on possible future discoveries, a note on taxonomy, and a bibliography running 33 pages. There are hundreds of images here to go with the text, ranging from photos to Bill Rebsamen抯 wonderful color illustrations. This is one of the classic books, not just of cryptozoology but of modern zoology and conservation biology. Readers will love it enough to revisit it many times. It抯 a great achievement." Matt Bille, Matt's Sci/Tech Blog, http://mattbille.blogspot.co.uk/, 16 December 2012.